Why use the Sticky Discount Box? The Sticky Discount Box will be displayed in the bottom left corner of your store, and it will expand once visitors click on it. After that, they just need to tick the 'Send to Messenger' box and then hit the 'Subscribe' button to get their discount code. Since it's a two-click subscription option, you can expect much higher conversion rates than with email popups. To provide a seamless user experience, we also added a Smart Display function which enables you to only display the Sticky Discount Box if the visitor is logged in to Facebook. How to set up the Sticky Discount Box? 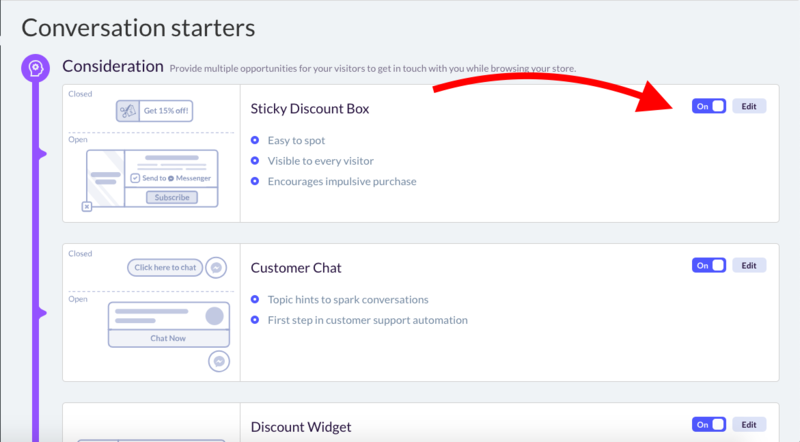 Setting up the Sticky Discount Box is easy as pie - you can enable it on the Conversation Starters Page by clicking on the switch next to it, and making sure it says 'On'. You can edit the content and appearance of your Sticky Discount Box by clicking on the 'Edit' button next to the switch. The Sticky Discount Box editor enables you to edit the colours to match your brand, and to change the promotion text and the discount code itself. You can offer any kind of discount - just make sure to create the code in your Shopify Admin first. Once you're finished editing and enabling your Sticky Discount Box, there's one more thing left: making sure you welcome your new subscribers with the Messenger Welcome campaign. That's not only a great way of improving user experience, but it also helps you trigger engagement from your subscribers so they are added to your permanent subscriber list, and you'll be able to send them Instant Messenger Campaigns later on. 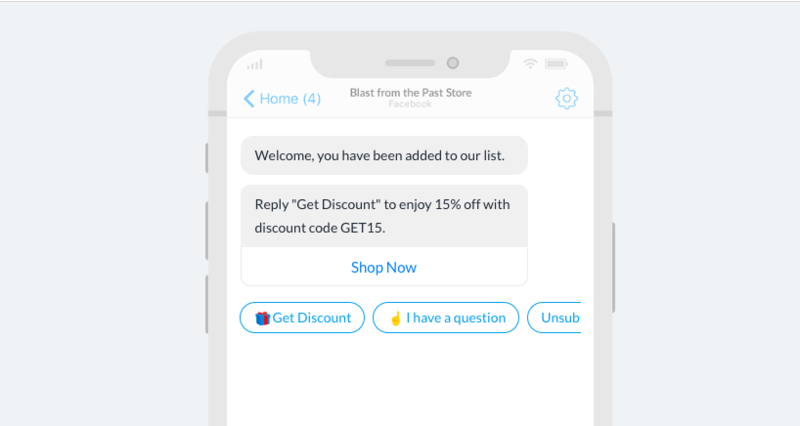 You can enable it by navigating to the Messenger Auto Campaigns page, clicking on the 'Edit' button next to Messenger Welcome then clicking on the switch next to the Sticky Discount Box. The Sticky Discount Box is not showing up, what could be the problem?